Draw cord see-through poly bag is water restistant. Great for use as a transport bag or for check handling. 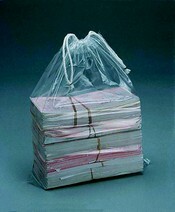 Less costly than cloth bags, and reusable. Pricing for larger quantities available.